Jaime is a first generation college student from Missoula, Montana. She joined the United States Navy in an effort to serve her country, break the familial cycle of poverty, and pursue higher education. Her enlistment was short-lived because of medical complications, but her passion to continue to serve was ignited. In conjunction with her active duty and family outreach as a Navy spouse, she navigated the complex structures of college admissions at community colleges, private institutions, regional state institutions, law schools, and top research institutions at the undergraduate and graduate levels. During her time as a student and collegiate administrator, she worked to assist transitioning veterans with acclimation to campus life, empowering students to rebuild their sense of self after military service, career and academic advising, and demilitarizing resumes. 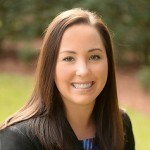 She currently works as the Assistant Director of Industry Education &amp;amp; Experience at the University of Florida where she will be pursuing her Ph.D. in Higher Education Administration. She earned dual Bachelor of Arts Degrees in Political Science and Economics and a Master of Educational Leadership from the University of North Florida after transferring out of state from California.